The following article was written by SaveDolphins.net, a marine mammal welfare and rescue group located in Russia. Dolphins on a dairy farm. How is this even possible? About two weeks ago, we received information about two dolphins being kept in Veselovka, a distant village in the Krasnodar region. These animals had been kept in a silo on an isolated dairy farm for several months. It was in the middle of nowhere. A witness told us that the dolphins were in a critical condition. Stressed and hungry, they were living in unfiltered and dirty cold water. 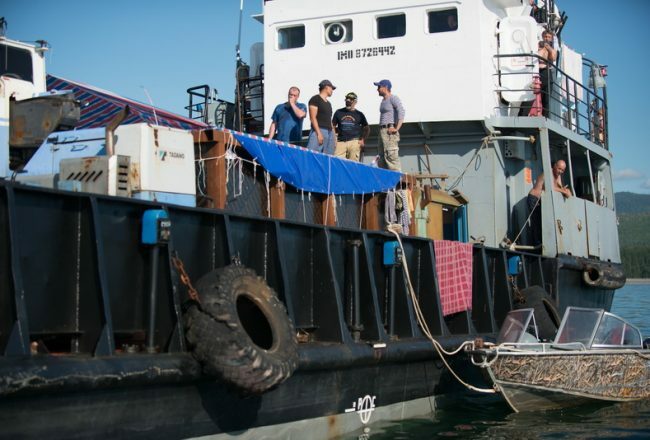 In the previous month prior to this incident, we had started to talk seriously about the first rehab and release center for dolphins in Russia. After learning of the two dolphins in distress, we knew it was not a coincidence but a sign that we were on the right path. We knew that immediate action was needed. SaveDolphins.net is a group of people from different cities and countries united by the same passion — dolphins, and we knew that these dolphins would die unless we did something about it. At first, the plan was to collect money, buy the dolphins and move them somewhere until we could build our rehabilitation center. But we felt very nervous and had conflicted feelings about buying dolphins from bad people who had captured them in the first place. We realized that we couldn’t wait because we didn’t even know if the dolphins were still alive. So, on November 26, our activists from Crimea and Moscow came to Krasnodar, and one day later, we invited along some local journalists and went to Veselovka. When we arrived, it was cold with wide open fields and few buildings. We soon found the farm that we had been looking for. We also noticed some buildings with pens in which there were many cows and horses, who looked like they had been fattened up. Presumably, there was a slaughterhouse, as when we approached, we noticed some bones in the grass. We passed through an open gate, we didn’t notice any warnings on the walls. We greeted an elderly lady, she greeted us back even though she didn’t understand who we were, and we headed towards the shed where the dolphins were kept. We saw trainers near it and their faces were familiar to us, they had worked this past summer in the illegal dolphinarium in Izmailovsky Park in Moscow. We suspected that these two dolphins were Zeus and Delfa from Izmailovsky Park. 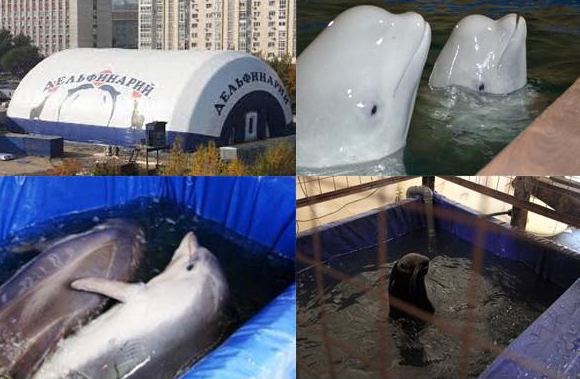 They disappeared at the end of the summer, and the dolphinarium moved away. Nobody knew where they went. One of our activists had worked in the dolphinarium for a short time. She told us that these dolphins had not been trained and seemed practically wild. They were not taught to eat dead fish, nor taught to undergo a medical examination. We learned later that these animals had been moved to Moscow from Sevastopol, and we’re sure that they are victims of an illegal dolphin capture in the Black Sea. Back in Krasnodar, the trainers carried buckets filled with goby fish — the worst fish to feed dolphins. We greeted them and introduced ourselves. We said that we knew what animals they were keeping in that hellhole and in what condition. They wouldn’t answer any questions and just said, “I need to make a call”. We made sure to film every step they made. A farmer approached us — the owner of the whole farm, and he shouted at us and even tried to physically harm us. As our people quarreled with the farmer, we (three activists, former trainers, and a journalist), entered the shed through a broken window. Most of the window panes had been broken by strong wind. We ran to the dolphins, who were hanging on the surface. We took a water sample, filmed their damaged skin and their thin, emaciated bodies. The water was filthy with waste product, and the holding tank was unbelievably shallow. The depth ranged from 0.5 meters to 2 meters at its deepest point. The water salinity did not meet the animals’ physiological needs — it was practically freshwater, which could easily leave the dolphins without vision. We watched the animals crawling on the dirty tile and scratching their stomachs. Both were stressed, hungry and shivering. The water’s temperature was just seven degrees. We filmed that hellhole from the inside for almost an hour, until our people called us and told that we had to leave. As we exited the shed, we noticed that the local deputy had arrived. She was given photos of fake documents for the dolphins. We got into the car and drove away, it was dangerous to stay there. We had wanted to stay close to the farm in order to observe what is going on, but our biologist who had dealt with people like this had been threatened and beaten before. So we drove as far away as possible, but our thoughts remained with the dolphins in that dirty silo hole. The owner of Zeus and Delfa is Michael Krokhin, an influential businessman and the former director of the dolphinarium in Moscow Zoo. He is a poacher involved in illegal dolphin trafficking. We have documents supporting this. Krokhin is also involved in the business of breeding wild animals in order to hunt them. We have information that recently Michael Krokhin was keeping horses knee-deep in muck for months before the horses were shot in the manner of hunting. Days ago we also received some document scans showing that he recently killed 17 baby walruses during their transportation after capture. It is important for people to understand who we have to face. Having been in contact with people who have been fighting with Krokhin for a long time, we learned they repeatedly received threats against their families. He is a well-connected businessmen with ties to the government. 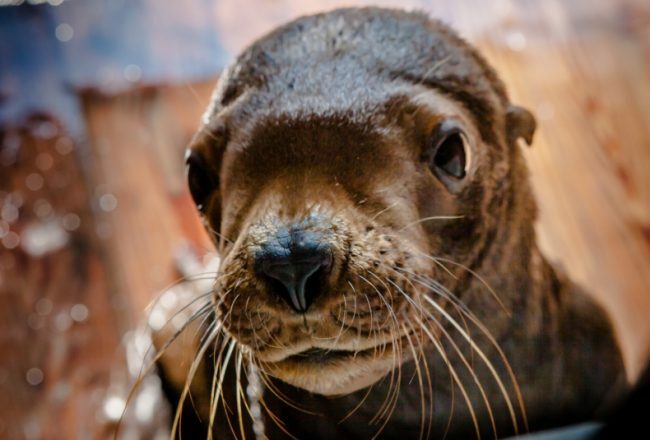 Our former-trainer colleagues told us that it’s impossible to confiscate animals from him. Thankfully, the two dolphins are now housed in better conditions. Here is a timeline of what took place. We spent the whole day answering phone calls and letters from journalists. We sent letters to local government authorities and the deputy helped us with that. We wanted to find an independent vet to take to Veselovka so we could get accurate information about the animals’ condition. Unfortunately, our familiar vets could not get there, so we invited famous correspondents from a Russian TV channel to go with us the next morning, and they willingly agreed. After a long drive, we met journalists from Russian News Channel – NTV. As soon as we got to the farm we saw a man hanging a huge lock on the gate. We realized that they were not going to let us in, but we were not going to leave that place. We decided to wait and see what happened. After an hour of filming everything and talking to journalists, we noticed seven cars drive in. It was the State Veterinary Service. We asked if they are going to check on the dolphins and they said ‘no’, but they went directly to the shed where the dolphins were kept. We called the district police, hoping that they would help us to get inside. They arrived but paid no attention at us. Moreover, all these people were in collusion. It was obvious that they were all friends paid by the farm owner. We saw no results that day, but we were not going to give up. Another day sending letters and spreading awareness among media. A famous Russian newspaper announced that a veterinary assessment had been done in Veselovka on November 28. The vets wrote that the dolphins were kept in wonderful conditions, completely healthy! Krokhin added, “The animals owned by me are living in the largest tank in Russia, with warm crystal clear water, I love dolphins, the activists’ told lies”. We were shocked, it appeared he was trying to smooth over the situation and get away with the dolphins, but we were not going to let him do that. We were thinking about where to move the dolphins in case of a confiscation. With no rehabilitation center yet, the only place that can give proper care for dolphins is a dolphinarium. As we have connections in that area, we analyzed all the options and picked the best place possible in Russia – Anapa dolphinarium in Big Utrish. They have open sea pens. We know that the director cares for animals so we decided to reach out to her. 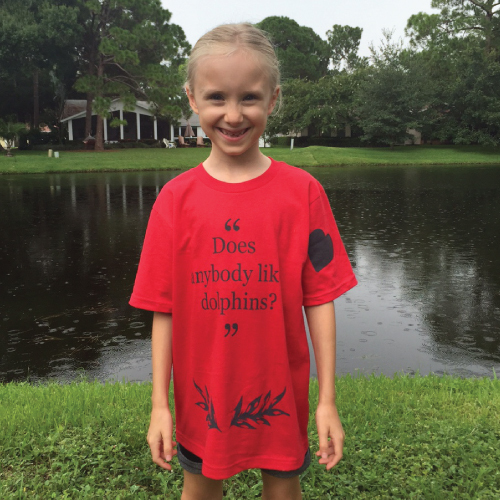 We asked her for help and she said that of course, they can accept our dolphins. They prepared a quarantine pool immediately, but we still had no idea if we could confiscate the dolphins in the first place. That evening we found a newly-released article in the online newspaper where Vet Services again said that the animals were in good condition and that they played and ate well. They also said that the dolphins’ belonged to northern seas and so don’t feel cold. Again they attempted to reassure everyone that the water was in perfect condition and a filtration system was in place filtering water from the sea. We could not believe it. They were trying to play this whole thing down and fool everyone. But there was no way we would give up. We strongly believed that we would get these dolphins out of that hole. Early this morning we received a message from the dolphinarium. The police were in Veselovka, and they had also sent people to rescue the dolphins. The Environmental Prosecutor’s Office, who received hundreds of letters from us, had agreed to confiscate the animals. This was a huge victory for us and for people from all over the world and Russia. Many took their time to contact government authorities in order to stop this cruelty. We went directly to Big Utrish. After a few hours the truck with dolphins arrived. Luidmila Kamaeva (the director of Anapa dolphinarium in Big Utrish) allowed us to attend the process of releasing dolphins into the pool with clean and fresh sea water. Delfa was unloaded first, she was weighed and inspected. 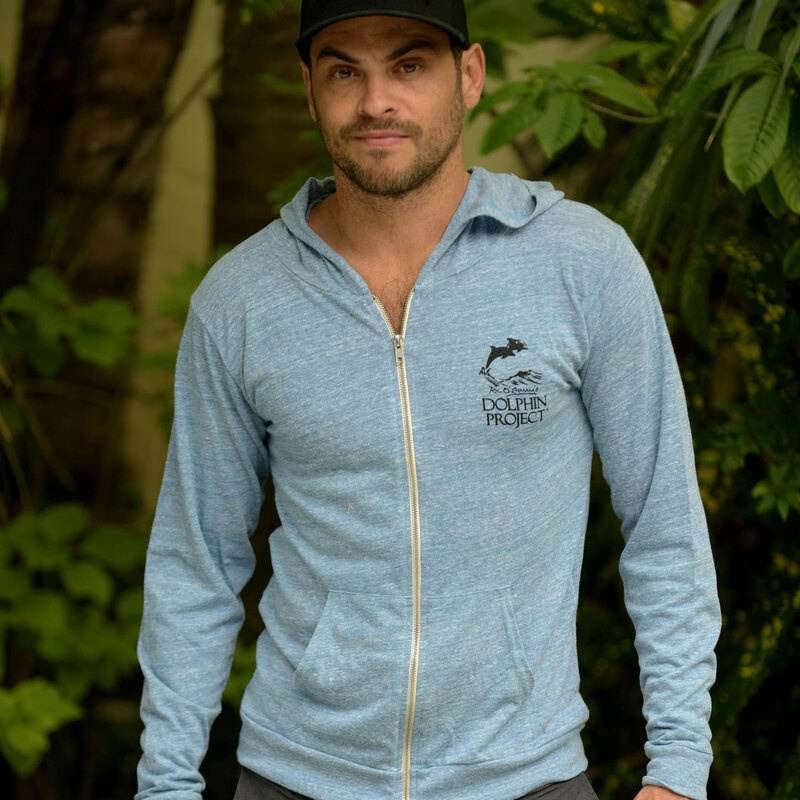 189 kg, just below the 190-210 kg for healthy dolphins. After releasing her into the pool, she immediately turned and came up to us. She looked so grateful and we knew by her expression that she was thankful. When they started unloading Zeus, something incredible happened. While being weighed and inspected by vets, he just lay and endlessly looked one of our activists directly in the eye, even though the activist was not very close to him. Zeus weighed in at just 109 kg. After he was released into the pool, the staff told us not to bother them and we had to leave. It was still the best day of our lives. Luidmila Kamaeva was very polite with us and she allowed us to visit the dolphins every day except Monday (the dolphinarium is closed on Mondays). As soon as we got there we felt that the staff was not very happy to see us and they treated us as if we were criminals. They said someone had to control us all the time. We said that we would never hurt the animals as we gave all our energy to saving their lives. Their answer we received was shocking: “You did nothing good. You put a huge burden on the dolphinarium because these dolphins are unsuitable for shows”. According to the vets, both dolphins are adults and in their 20’s. Their age explains a lot — it might be the main reason why the animals can’t be trained. Illegal dolphin captures are common in Russia. The poachers don’t know how to identify the age, they just capture every dolphin in their way. We stayed with Zeus and Delfa for about 40 minutes. The trainer said that they ate well and their blood samples results were good, but both dolphins have scoliosis, particularly Delfa — we saw the deformation of her caudal peduncle distinctly. This disease strikes cetaceans when they are kept in the worst conditions in a very small pool depth. Both Delfa and Zeus had been kept in a pool whose average depth was less than one meter. Delfa is more interested in people than Zeus, he looks like he doesn’t trust them anymore. It was cold and storming strongly, so we had to leave. We were very angry about the staff when we realized that they were not happy to treat Zeus and Delfa. We want to take them away when our rehabilitation center is ready — we already have specialists and we are working on a plan for their rehab and will release it very soon. Many people have told us that rescuing these dolphins was an impossible thing to do, but we kept going. We did it. We saved Zeus and Delfa for now and we will keep on going until the moment we see them free. All videos courtesy of the SaveDolphins.net organization. Дельфины на ферме. Как же такое возможно? Около двух недель назад от местных жителей мы получили информацию о том, что двух краснокнижных дельфинов-афалин содержат в ужасных условиях в Веселовке – далеком селе Краснодарского края. Этих животных несколько месяцев держали в силосной яме бывшего коровника, на скорую руку оборудованную под подобие бассейна. Очевидец сообщил, что дельфины находятся в критическом состоянии – голодные, замерзающие, испытывающие сильный стресс, они с трудом выживали в не фильтруемой ледяной воде среди собственных отходов. Как раз за месяц до этого инцидента мы всерьёз начали говорить о создании первого реабилитационного центра для дельфинов в России. Узнав о двух несчастных дельфинах, мы поняли, что это не случайность – это знак, что мы на правильном пути. Мы поняли, что действовать нужно немедленно. SaveDolphins.net — это группа людей из разных городов и стран, объединившихся ради общей цели — помощи китообразным. Мы знали, что эти два дельфина просто умрут, если мы что-нибудь не предпримем как можно скорее. Сперва мы намеревались собрать деньги, выкупить дельфинов и забрать их туда, где мы могли бы постепенно возвести реабилитационный центр. Но все же, класть деньги в карман алчных людей, отловивших этих животных и содержащих их в таких кошмарных условиях – было неправильным шагом, так что мы быстро отказались от этой идеи и решили как можно скорее перейти к прямым действиям. Мы понимали, что не можем больше ждать, так как даже не знали, сколько еще протянут эти дельфины и живы ли они вообще. 25 ноября наши активисты из Крыма, Санкт-Петербурга и Москвы приехали в Краснодар. На следующее утро они встретились с местными журналистами и отправились в Веселовку. Когда мы приехали на место, первым, что мы увидели, было огромное холодное поле с несколькими зданиями. Через некоторое время, поездив по окрестностям, мы нашли необходимую нам ферму. Мы также обнаружили несколько строений с загонами, в которых находилось большое количество коров и лошадей, которые выглядели так, словно выращивались на убой. Предположительно, там же была и скотобойня, так как позже на данной территории мы обнаружили множество костей, лежащих в траве. Мы зашли в открытую калитку, не обнаружив ни единого предупреждающего знака на заборе. Первым делом мы увидели местную пожилую женщину и поприветствовали ее. Она поприветствовала нас в ответ, явно не поняв, кто мы такие. Мы же в это время спокойно направились к ангару, где томились дельфины. Возле входа в ангар мы увидели тренеров. Их лица были нам знакомы – эти люди минувшим летом работали в дельфинарии в Измайловском парке в Москве. Мы быстро поняли, что те два несчастных дельфина были Зевсом и Дельфой из того самого Измайловского парка. Дельфинарий уехал в конце лета и дельфины исчезли вместе с ним. В СМИ писали, что они отправились в Краснодар. Одна из наших активисток работала в этом дельфинарии какое-то время – она сказала нам, что эти дельфины практически не поддавались тренировке и на тот момент были практически дикими. Они не умели полноценно есть мертвую рыбу, не были приучены добровольно позволить провести на себе медицинское обследование. Позже мы узнали, что эти дельфины были отправлены в Москву из Севастополя, и мы уверены, что они были пойманы браконьерским путём в Чёрном море. Вернёмся в Краснодар, – тренера несли в вёдрах бычков — наихудшую рыбу, какую только можно выбрать для дельфинов, не используемую ни в одном дельфинарии вследствие ее низкого качества, питательности и большой вероятности отравления. Мы поздоровались, представились тренерам и сказали, что располагаем информацией о том, что за животные содержатся в ангаре и в каких условиях. Они не хотели отвечать ни на какие вопросы и сказали только одно: «Нам нужно позвонить». Все это время мы снимали на камеру каждый их шаг. Вскоре после ухода тренеров мы увидели, как к нам приблизился фермер — хозяин территории, он кричал на нас и пытался выдворить силой. В то время, как наш биолог разбирался с фермером, мы (три активистки, включая бывших тренеров и журналист) вошли в ангар через разбитое окно – большинство стекол было выбито мощным ветром, и ледяной воздух гулял внутри. Мы подбежали к дельфинам, зависшим без движения на поверхности воды. Взяли пробы воды, засняли поврежденные рострумы, загноившиеся остатки от эмбриональных усов, раны и царапины на истощённых телах дельфинов. Вода, в которой находились животные, была очень грязной и ржавой, повсюду плавал мусор и продукты жизнедеятельности, а глубина ямы просто поражала – она варьировалась от 0,5 до 2 метров в самой глубокой точке. Вода также была недостаточно солёной – полу-пресный уровень не соответствовал физиологическим потребностям дельфинов и нес им угрозу слепоты. Мы видели, как дельфины практически ползали по грязной плитке, обдирая об нее животы. Оба пребывали в сильном стрессе, были голодны и дрожали – температура воды составляла всего 7 градусов. Мы снимали это жуткое место изнутри на протяжении часа, пока наши люди не позвали нас и не сказали, что нам пора уезжать. Выйдя из ангара, мы увидели приехавшего местного депутата. Она показала нам нечеткие фотографии поддельных документов на дельфинов, которые по ее требованию были присланы ей тренерами. Все вместе мы сели в машину и уехали, оставаться там дальше становилось опасно. Мы хотели тайно остаться возле фермы, чтобы проследить за всем происходящим, но наш биолог, имевший дело с подобными этому фермеру людьми, уже подвергался угрозам и даже был неоднократно ими избит. Потому мы уехали настолько далеко, насколько это было возможным, но наши мысли были заняты только дельфинами, оставшимися в грязной силосной яме. Хозяин Зевса и Дельфы — Михаил Крохин, влиятельный бизнесмен и бывший директор дельфинария в Московском Зоопарке, и по совместительству – браконьер, зарабатывающий на нелегальном отлове дельфинов. У нас есть документы и факты, прямо или косвенно подтверждающие это. Крохин также замешан в разведении диких животных для последующей охоты на них. У нас также есть информация, что Михаил Крохин месяцами держал лошадей по колено в навозе, прежде чем они были расстреляны в порядке охоты. Мы также располагаем информацией и копиями документов, говорящих, что еще недавно он убил 17 детенышей моржей во время транспортировки после отлова. Эта информация важна для понимания того, с кем мы столкнулись лицом к лицу. Пообщавшись с людьми, которые в своей жизни уже имели дело с Крохиным, мы узнали, что он не гнушается и покушений на семьи тех, кто перешёл ему дорогу. Это бизнесмен, имеющий хорошие связи с правительством. Коллега нашего бывшего тренера говорил нам, что конфисковать у него животных просто невозможно. Мы провели уйму времени, отвечая на телефонные звонки и письма журналистов, отправили письма в местные авторитетные правительственные инстанции, депутат тоже помог нам. Мы также хотели найти независимого ветеринара и отправиться с ним в Веселовку, чтобы добиться правдивой информации о состоянии животных. К сожалению, наш ветеринар в силу обстоятельств не мог отправиться туда, поэтому мы пригласили известных корреспондентов российского телеканала, чтобы отправится с ними на ферму следующим утром, и они охотно согласились. После долгого пути мы встретились с журналистами с телеканала НТВ. Как только мы добрались до фермы, мы увидели человека, вешающего замок на ворота. Мы поняли, что попасть внутрь нам не удастся, но мы не собирались покидать это место – потому остались ждать и наблюдать, что будет происходить дальше. После часа съёмок всего вокруг и разговора с журналистами, мы увидели семь подъезжающих машин. Среди них была Государственная Ветеринарная Комиссия и несколько других авторитетных органов. Мы спросили, собираются ли они проверить дельфинов, но нам ответили «нет», и тем не менее прямо после этого вместе с хозяином фермы и тренерами они отправились прямиком в ангар, где содержались дельфины. Мы позвонили местному участковому в надежде, что он поможет нам попасть внутрь. Вскоре он приехал, но не обращал на нас никакого внимания. Более того, все эти люди были в сговоре, что было видно невооруженным глазом, и было абсолютно понятно, что все они – друзья, уже проплаченные. День оказался совсем безрезультатным, но мы не собирались сдаваться. Очередной день рассылок и распространения информации для СМИ. В популярной российской газете написали, что ветеринарный контроль был проведён в Веселовке 28 ноября. Ветеринары подтвердили, что дельфины находятся в прекрасных условиях и абсолютно здоровы! Крохин сказал: «Животные принадлежат мне и живут в самом большом бассейне в России с кристально чистой водой. Мы дельфинов любим и предоставляем им самые лучшие условия, а активисты – лгут». Мы были в шоке, было ясно, что теперь он попытается скрыть информацию, сгладить ситуацию и уехать вместе с дельфинами, но мы не собирались ему этого позволить. Мы думали над тем, куда нам деть дельфинов после конфискации. Не имея реабилитационного центра, лучшее, что мы могли сделать, было доверить уход за дельфинами персоналу дельфинария. Имея представления о данном регионе, мы проанализировали все варианты и выбрали лучшее место, которое только могло быть в России, – Анапский дельфинарий в Большом Утрише. Это дельфинарий, расположенный в море, с огороженными для животных вольерами. Мы знали, что директор этого дельфинария заботится о животных, потому обратились к ней. Мы попросили ее помочь нам, и она довольно быстро согласилась. Они тут же приготовили карантинный бассейн, но мы всё еще не знали, как нам конфисковать дельфинов из их текущего местонахождения. В этот же вечер мы увидели новую статью в онлайн-газете, где было написано, что ветеринарная экспертиза вновь подтвердила, что животные находятся в отличных условиях, они игривы и сыты. Также они сказали, что это дельфины из северных морей и холод им не страшен. Они снова уверяли всех, что вода в прекрасном состоянии, а фильтрационная система находится в месте, откуда закачивают морскую воду. Мы не могли в это поверить. Они пытались замять эту историю, и всех обмануть. Но и это не заставило нас падать духом. Мы были твёрдо уверены, что вытащим дельфинов оттуда. Рано утром мы неожиданно получили сообщение из дельфинария. В Веселовке уже была полиция и сотрудники дельфинария, отправленные туда с целью изъять дельфинов и увезти их в Большой Утриш. Природоохранная прокуратура, ранее получившая от нас сотни писем, согласилась конфисковать животных. Это было большой победой для нас и еще множества людей из разных городов и по всему миру, следивших за их судьбой. Множество людей предприняло действия и распространяло информацию, обращалось к правительству с просьбами остановить эту жестокость. Мы поехали в Большой Утриш. После нескольких часов ожидания, наконец, появился грузовик, перевозивший дельфинов. Людмила Камаева (директор дельфинария) позволила нам заснять процесс разгрузки и перемещения дельфинов в выделенный для них карантинный бассейн со свежей морской водой. Первой была выгружена Дельфа, после чего ее взвесили и обследовали. Ее вес оставлял 189 кг, ниже среднего веса 190-210 кг для здорового дельфина. После того, как ее выпустили в бассейн, она сразу же развернулась и подплыла к нам. Она выглядела благодарной и по ее жестам и выражению казалось, что она говорит нам “спасибо”. Когда начали выгружать Зевса, произошло нечто невероятное. Будучи взвешенным и обследуемым, все это время он просто лежал и долго, не отрываясь смотрел прямо в глаза одной из наших активисток, несмотря на то, что она стояла не рядом с ним. Вес Зевса составил 109 кг. После того, как он был выпущен в бассейн, мы провели с ними еще некоторое время, после чего, работник дельфинария сказали, что дельфины устали, и мы были вынуждены уехать. Это был один из лучших дней в нашей жизни. Людмила Камаева была очень любезна с нами и разрешила нам навещать дельфинов. Но как только мы приехали в дельфинарий во второй раз, мы ощутили, что персонал не очень-то рад нас видеть – можно сказать, к нам отнеслись практически как к преступникам, т.к. они сказали, что кто-то должен обязательно ходить по территории вместе с нами и контролировать наши действия. Возмутившись, мы сказали им, что никогда не причиним вреда животным, поскольку сами тратим уйму энергии, чтобы спасти их жизни. Ответ, который мы получили, был шокирующим: “Вы не сделали ничего хорошего, потому что повесили огромный балласт на дельфинарий. Ведь эти дельфины не пригодны для шоу”. Как сказали ветеринары, оба дельфина – взрослые, им примерно по 20 лет. Их возраст очень многое объясняет – это главная причина того, почему они уже не могут быть натренированы для участия в представлениях. Нелегальный отлов дельфинов – обыкновенная практика в России. Браконьеры не знают, как определяется возраст дельфинов и ловят всех без разбору. Мы оставались с Зевсом и Дельфой около 40минут. Оба проявляли любопытство, особенно хорошо на контакт шла Дельфа, в то время как Зевс, казалось, людям больше не доверяет. Тренер сказал, что они хорошо ели и результаты их анализов крови были нормальными, но вследствие переохлаждения и прочих нарушений содержания у обоих развился сколиоз, особенно выраженно – у Дельфы, мы отчетливо видели искривление ее позвоночника и хвостового стебля каждый раз, когда она проплывала мимо. Нам также сказали, что дельфины будут перемещены в морской вольер в течении 30 дней, после окончания карантина. Из-за шторма, бушевавшего вокруг, стоял сильный холод, так что нам нужно было уходить. Мы были очень расстроены тем, что нам сказал персонал, и думали только о том, что нам нужно как можно скорее забирать их оттуда, как только центр реабилитации будет готов – у нас уже есть специалисты и мы работаем над планом реабилитации Зевса и Дельфы и их дальнейшего выпуска в дикую природу. Множество людей говорили, что мы не сможем ничем помочь этим дельфинам и что мы обречены на неудачу, но мы продолжали идти к поставленной цели – и сделали невозможное. Мы спасли Зевса и Дельфу из грязной ямы и намерены идти до конца, до того момента, пока не увидим их свободными.